Jordan, Jesse, Go! Episode 182: Luna Park with David Malki! David Malki!, creator of Wondermark, joins Jesse and Jordan for further discussion of music festivals, making Brita tea and more. Lynda Barry is a legendary comic strip author whose Ernie Pook's Comeek has run for many years in alternative newspapers around the country. Her two most recent books, What It Is and Picture This are about writing and creating art, respectively. The former won an Eisner Award, comics' most prestigious prize. The books take the form of a notebook, filled with text, collage and drawings. The content is based on a series of seminars Barry has taught on getting creative work done. In our interview, Barry talks with Jesse about activating the brain and the benefit of doing creative work that doesn't need to fall into the dichotomy of beautiful/not beautiful, good art/not good art, or being productive/being nonproductive. JESSE THORN: It’s The Sound of Young America, I’m Jesse Thorn. My guest on the program is Lynda Barry. She’s one of the nation’s most accomplished comics artists, graphic novelists, comic strip writers, artists, etc. etc. Her comics have run in alternative newspapers across the country for many, many, many years and more recently she’s turned much of her time towards writing longer works. Her book of just a couple of years ago, What It Is, was about the process of writing, and her latest, Picture This, is about the process of making art. They’re beautiful multimedia comics collage works that, as I said, are about process. Lynda Barry, welcome to The Sound of Young America. LYNDA BARRY: I’m delighted to be here. Batman takes on his nemesis, The Riddler, who takes on himself in this comedy sketch from writer and performer Sarah Gee. You can catch Sarah perfoming at Improv Olympic in Chicago Sunday, Monday and Wednesday nights. 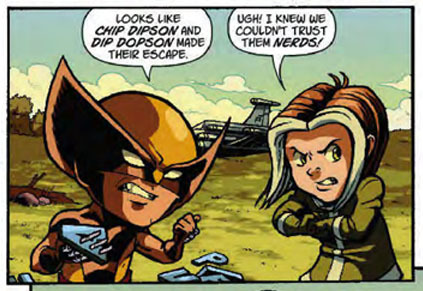 Our hats are off to comic book writer Gregg Schigiel for including everyone's favorite fictional characters, Chip Dipson and Dip Dopson in the brand new issue #2 of Marvel Comics' X-Babies. Charles Burns is a cartoonist and illustrator whose best-known work is the graphic novel Black Hole. His illustrations have been featured in The New Yorker, and his graphic art has promoted products like Altoids and Coca-Cola's short-lived hip spinoff, OK Cola. We spoke with him at the Philly Improv Theater in Philadelphia. Brian Michael Bendis on The Sound of Young America from Jesse Thorn on Vimeo. Brian Michael Bendis is an acclaimed comics writer. His work has ranged from independent crime comics to the artist-controlled superhero imprint Image to helming some of the most important characters in superhero comics for Marvel. Several years ago, he re-created Spider Man for the 21st century with Ultimate Spider Man. He now steers Marvel's most important superteam, The Avengers. We spoke with Brian at the Bridgetown Comedy Festival in Portland, Oregon. Our second video from our trip to the Bridgetown Comedy Festival. Shot and edited by Brian Brewer.